Find out more about the GEKA® plus hose trolley “P80” by navigating the hotspot. 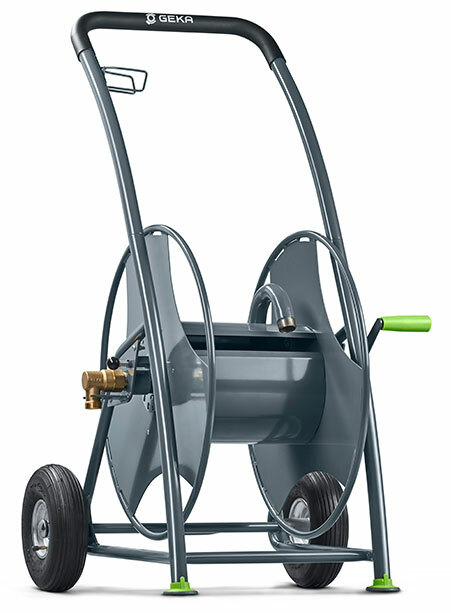 Incredibly reliable: In a tried-and-tested, solid steel construction – and thanks to a high water flow rate, a hose drum lockable in 12 positions, high stability and easier mobility – it can be used wherever it is needed: in garden centres and agriculture, on construction sites, in business or industry. The sturdy hose trolley is also suitable for drinking water, because all water-carrying parts comply with the drinking water ordinance.